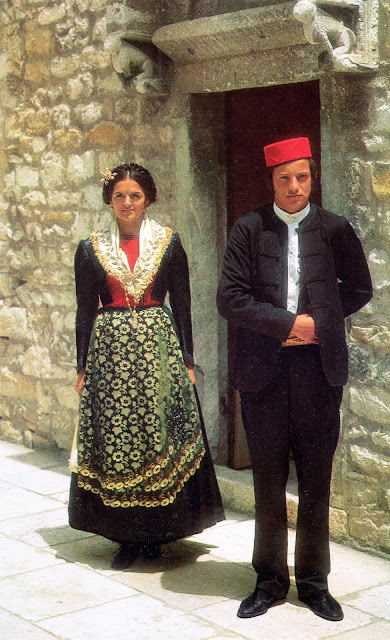 Today I will continue my series on the costume of Split and the central Dalmatian coast by discussing the men's costume. 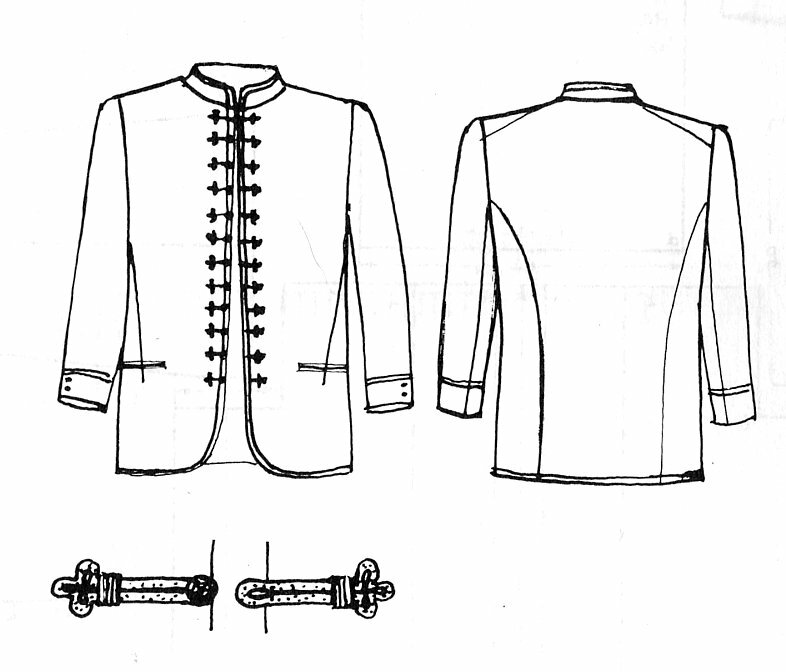 This falls into the style of clothing known as Dalmatinski veštit, or the 'Dalmatian Suit'. This is a version of the western style suit based on the native Balkan costume of Dalmatia. 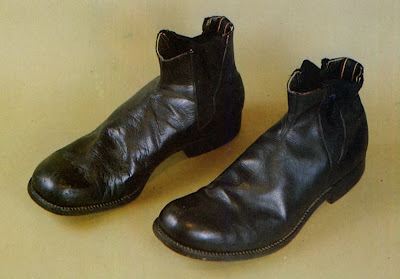 It became very popular in the mid 19th cent. 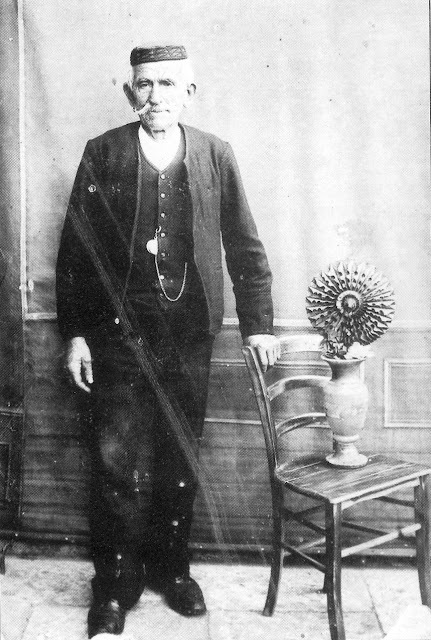 after Emancipation was proclaimed in the Austrian Empire as a symbol of freedom and civil life, and so was particularly popular among former serfs. 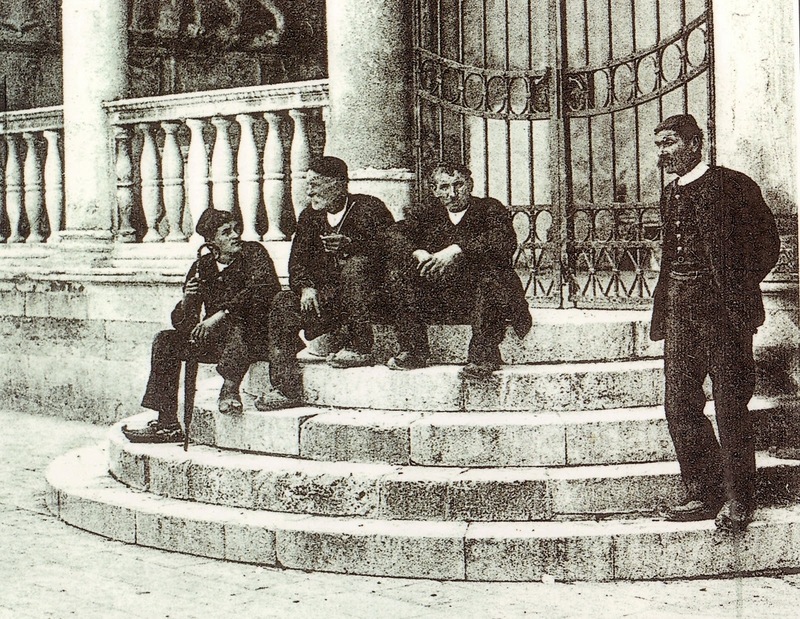 Here you see some men wearing the veštit with the traditional Dalmatian red cap and Opanci, the moccasin-like footwear native to the area. 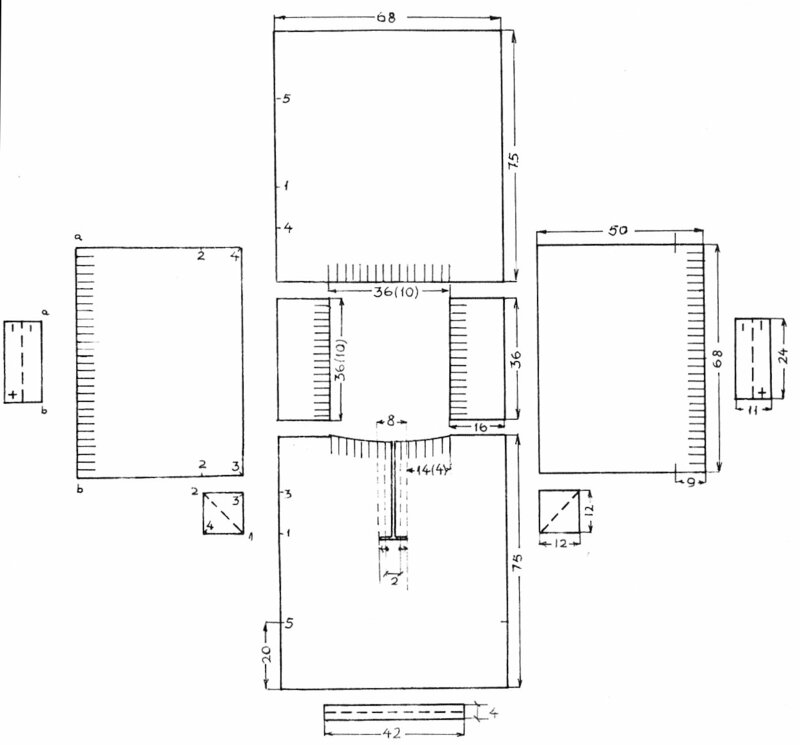 In the 20th cent. there was a renewal of interest in this form of clothing as a statement of Croatian Identity by those who lived on the coast. The mountain people inland kept their own costume, but some of the coastal communities had lost theirs, and so this distinctive form of apparel was adopted by many men who wished to show their Dalmatian Identity. 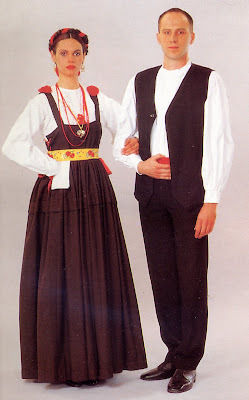 This basic outfit is worn as 'folk town costume' over a good portion of the coast. Again I have more information about the costume as worn in Split, so I will cover that in detail. For those of you who read Croatian, i refer you to this article for more information. And in other communities. 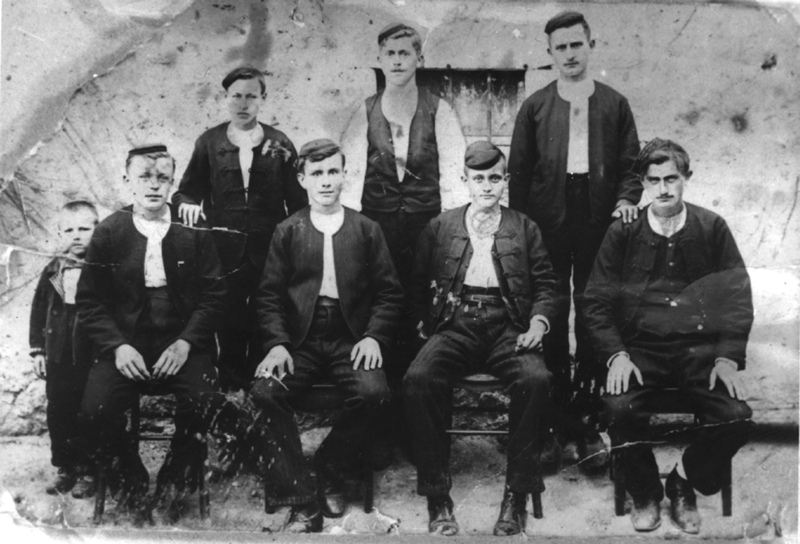 Here is a photo of a local choir from the village of Vrsi. 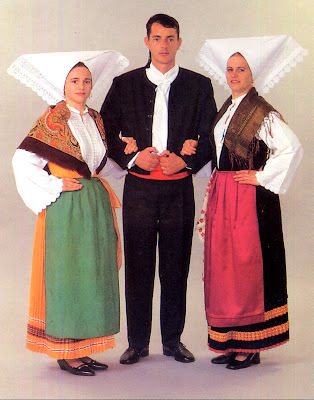 And here is a group which sings traditional Dalmatian coastal songs. They call themselves Koporan. You will notice that most of these are wearing some form of the red Dalmatian cap. Often either the jacket or the vest is worn, rarely both. Here is another view of the Split version. 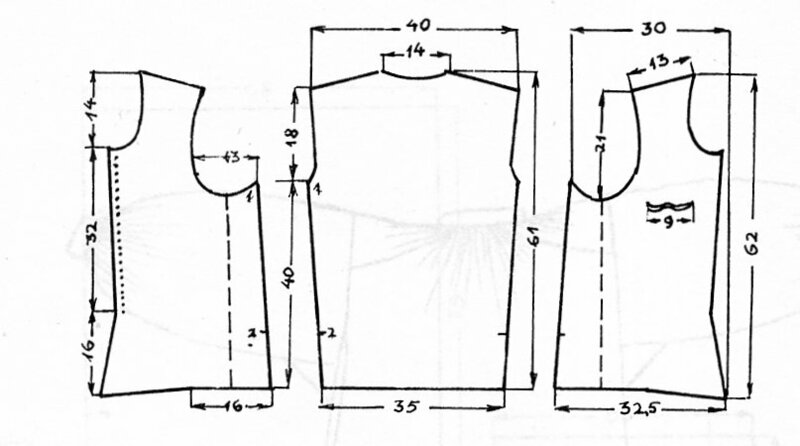 And now i will cover the Split costume in some detail The basis of the outfit is a cotton or linen shirt, the košuja. 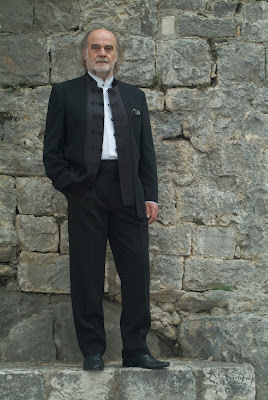 In Split, at least, it is made with shoulder insets, standing band collar and gathered into cuffs. 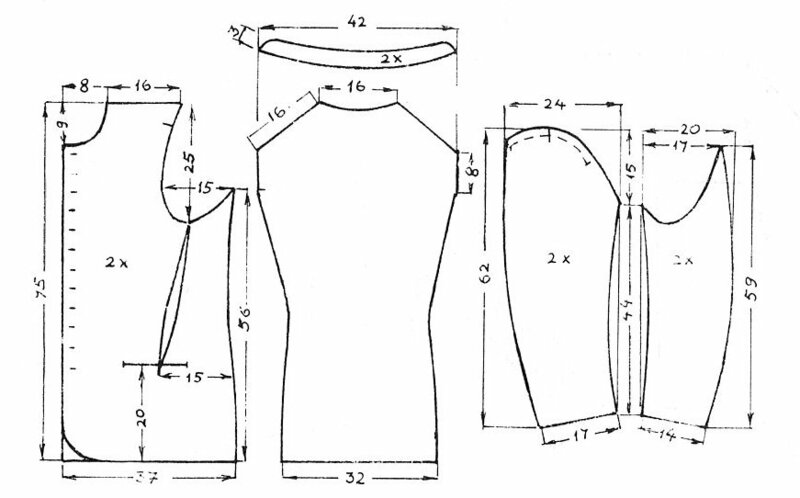 The pants, vest and jacket are made from black industrially produced wool cloth, called pan. 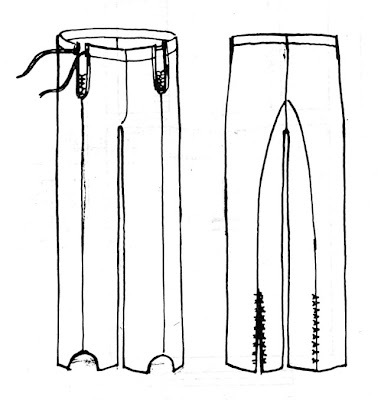 While the pants look like they have a standard western cut, closer examination reveals details which are derived from traditional Balkan style pants. 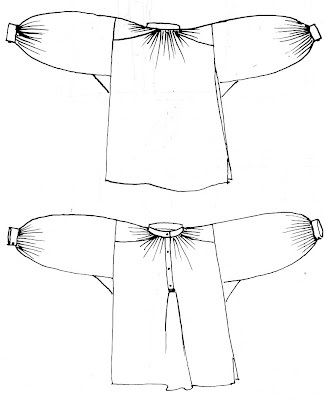 The waist is secured by a cotton tape acting as a drawstring, there are two openings at the waist which are decorated by black braid, the cuffs are very long, and have half circle openings for the feet, and the rear seam is closed at the bottom with a series of hooks. 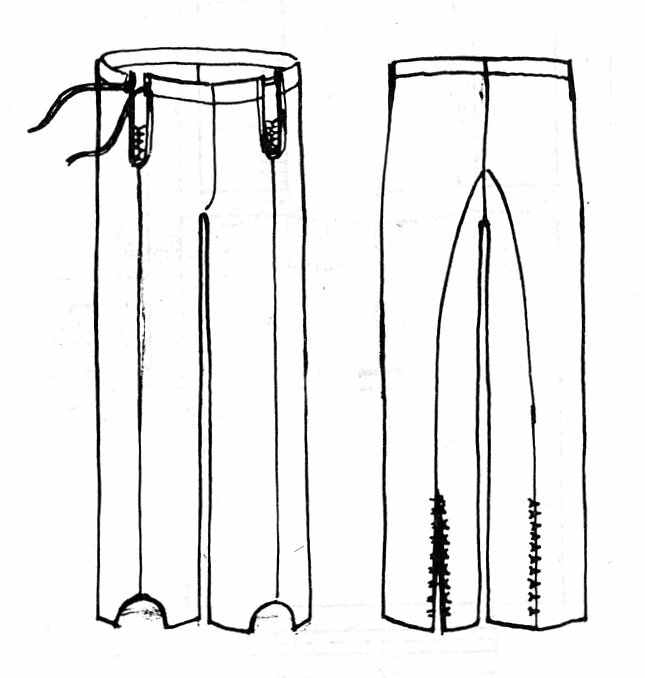 Most of these are characteristics of native Balkan style pants. 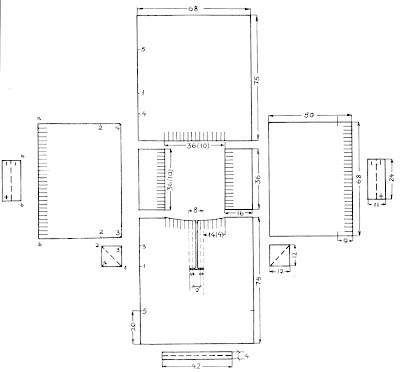 I suspect that many stage versions omit at least some of these details. Here is a closeup of one of the openings at the waist. 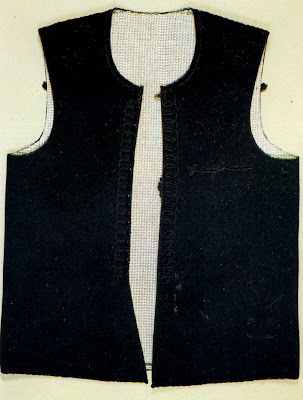 The vest is black, also decorated with black braid, and has a high neckline and no lapel, very similar to those worn in the Dinaric region just inland in the mountains. 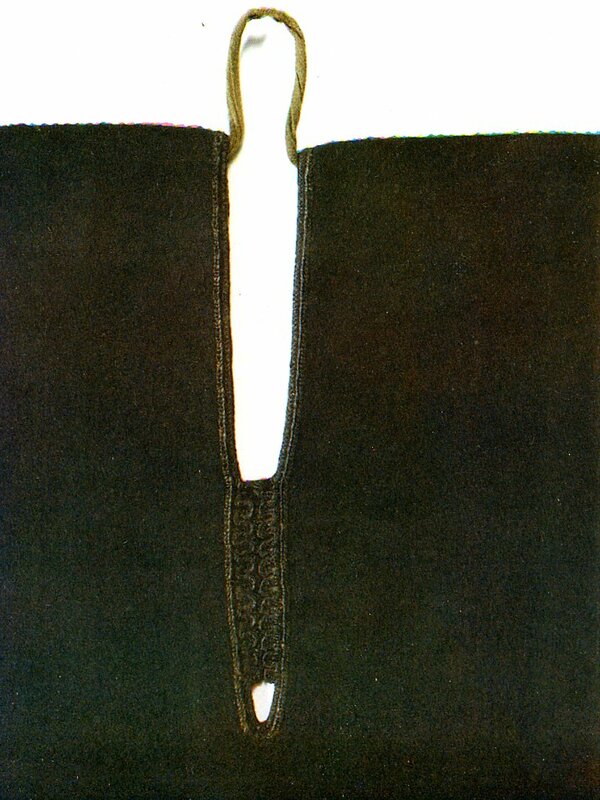 The braids form loops on one side of the opening, and it may be buttoned shut. 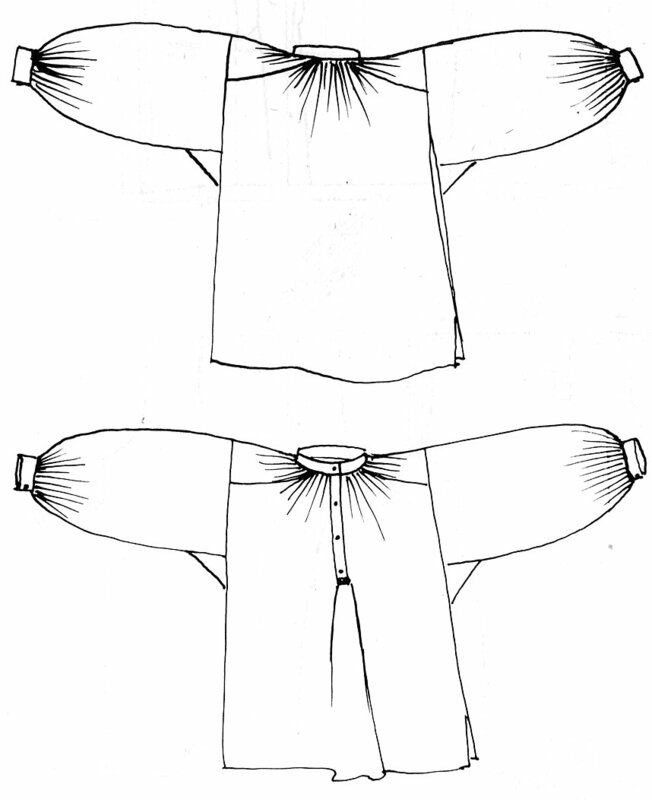 The vest may be worn open outside the pants, or it may be worn closed, with the pants and the sash over it. 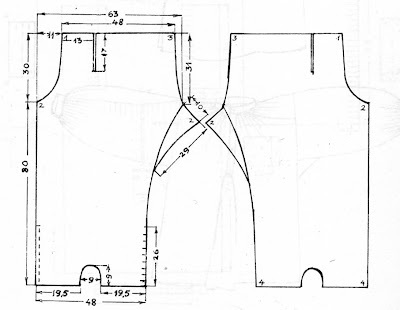 When the vest is worn inside the pants, the openings in the pants are not visible. 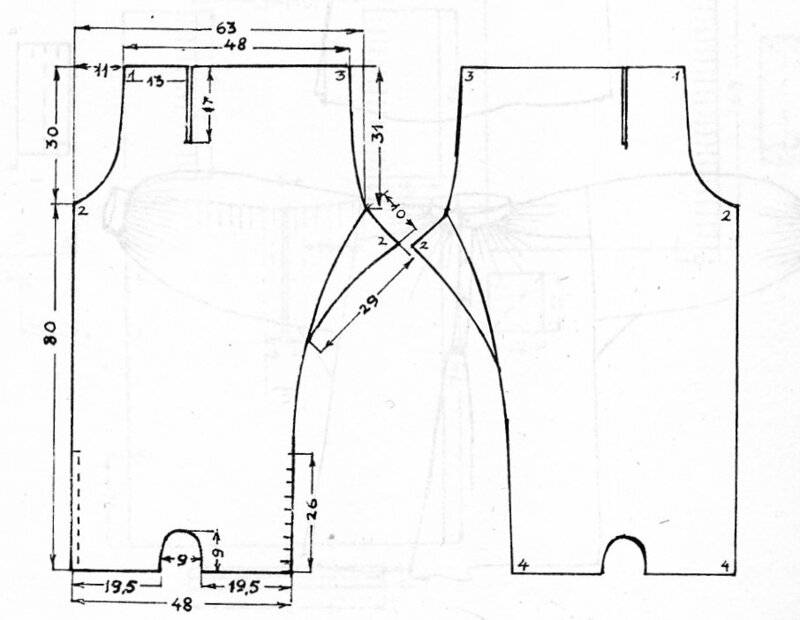 There is a small slit pocket on the upper left breast. The vest as worn on some islands has taken a lapel under western influence, but is still often worn under the sash. 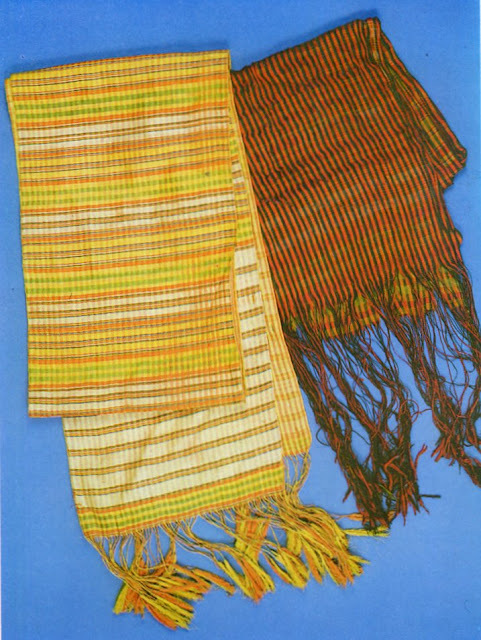 The sash is traditionally woven of plaid silk with knotted warp fringes at the ends, however this is often replaced with a sash of plain red cloth today. The sash should be long enough to wrap around at least twice with enough left over to tuck in. 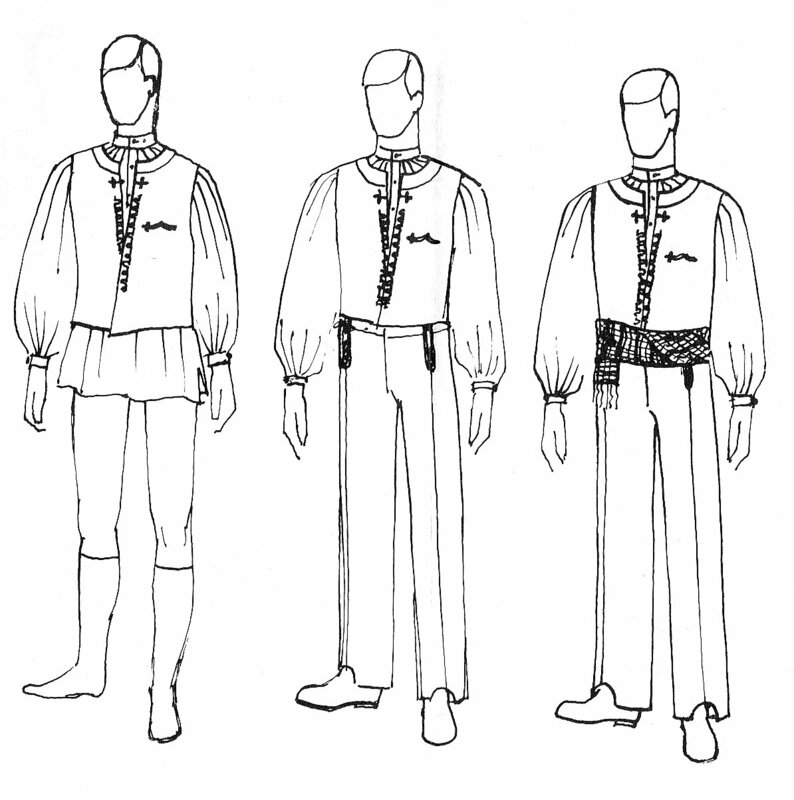 Over the vest and sash, the jacket should be worn. Most of the time i see men wearing either the jacket or the vest, but rarely both. 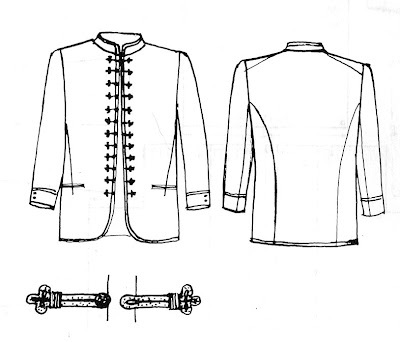 The jacket is usually cut just like a modern suit jacket, only without lapels, with a standing collar, braid around the edges, and loops and frogs along the front opening. The city costume is today completed with plain high black shoes, although from the photos above, we can see that opanci were worn with it in the past. 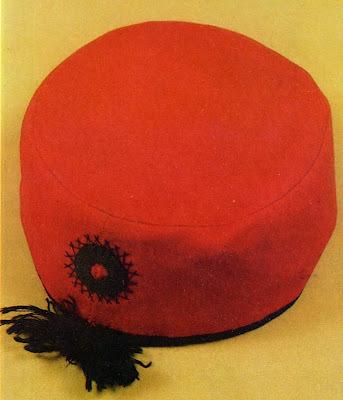 The red cap, the Crvenkapa, is an integral part of the identity of a Dalmatian man. 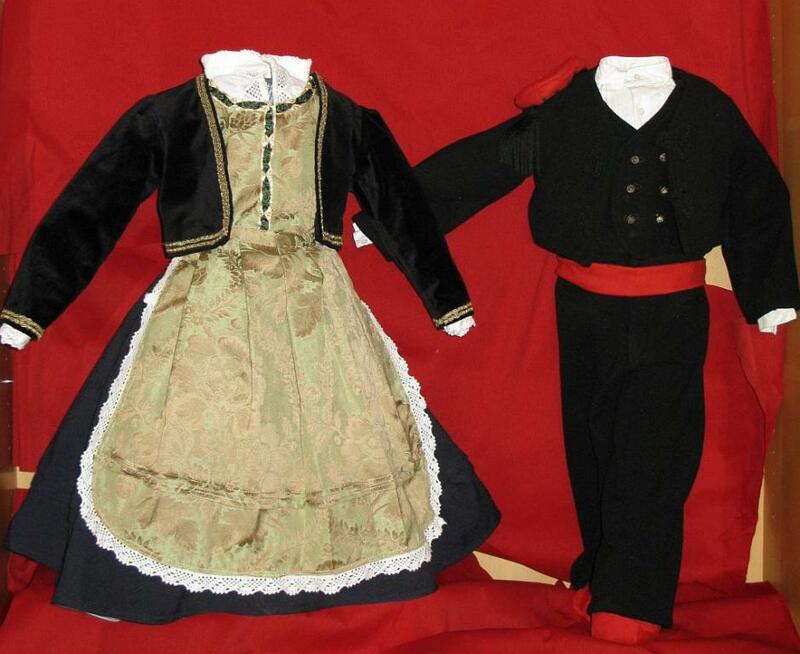 Even on those islands where most of the costume is based on western examples, many still hold on to some form, even if vestigial, of the red cap. A couple of exceptions are Krk, Susak, and Mljet. 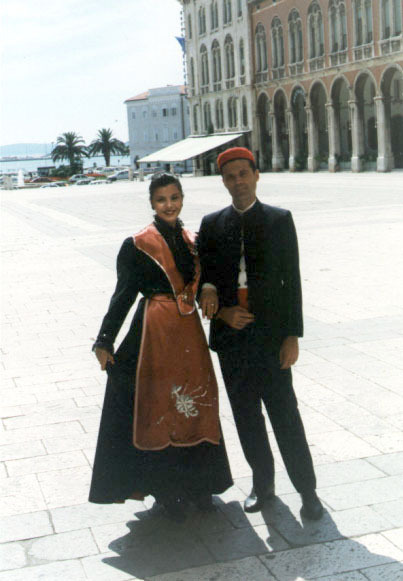 In Split, they still wear the red cap. The traditional black embroidery has been reduced to one circular patch, and the fringe to a small tuft on the back, but the cap is full-sized. 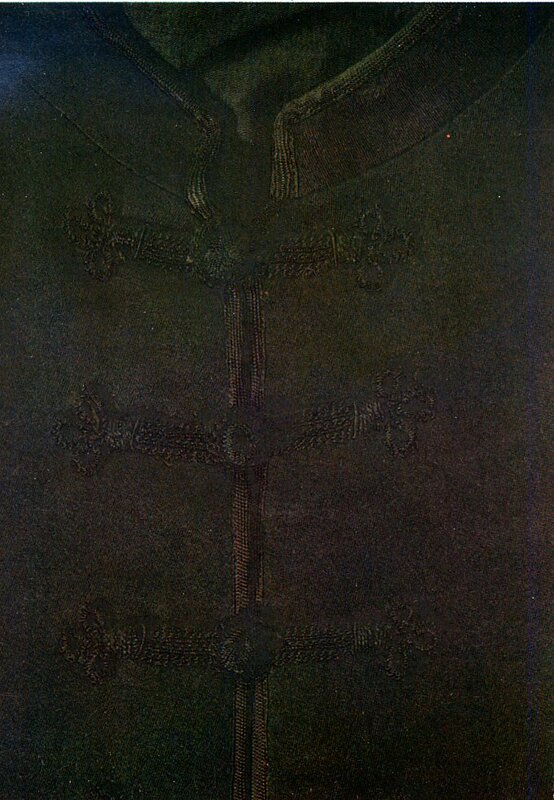 The opening is edged with black. I must say that i wholeheartedly support the men who continue to wear the Dalmatinski veštit, instead of giving in to the plain western uniform suit. It would be a poorer world if every place looked and dressed exactly the same. A couple of links to dances from Split. See also my previous posting which covered the woman's costume. 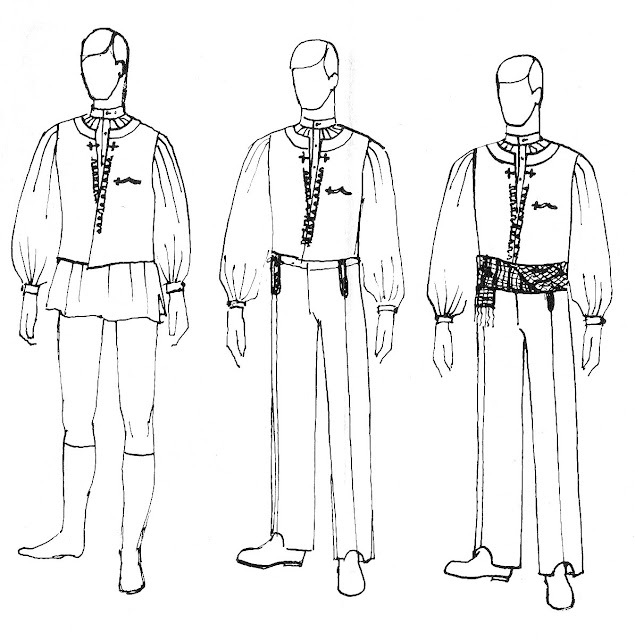 Dances from Split, all the men wearing the vest. A demonstration of traditional polyphonic Klapa music from the Dalmatian coast. 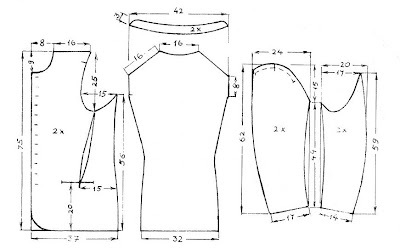 When I was searching some Men's Dance Suit found your blog. 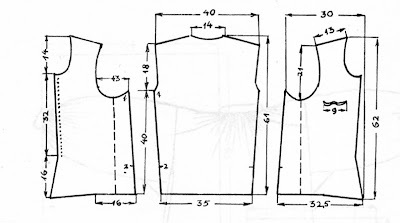 All the designs are looking very good. Thanks for sharing it on the web. Hi, we have an old vest at least 100 years old, it was my Deda's. Do you know where I can find out the value of it?